You may also not know that the bandstand was horribly vandalized by local teens over the summer. After one of our free concerts on the common, I was horrified by what I saw written and drawn into all of the bandstand floor and walls — graphic sexual drawings, filthy sayings, and far more unprintable filth. I don’t understand the need for teens to do so much damage. The Jaycees will need to spend hundreds of hours re-sanding and painting the bandstand when the weather gets better. While I have absolutely no faith that the guilty parties will come forward, may I at least ask them to consider the horrific damage done, and emphasize that the Foxboro police are keeping a very close eye on the bandstand? On that cheery note, I would like to present a list of some of the many Jaycee activities we are presenting around town this season, and hope you can join us. As always check out our web site, www.Foxborojaycees.org, for all the latest updates. Sand for Seniors: During winter, we deliver buckets of sand/salt to home-bound seniors to keep their walkways slip-free. To arrange for a delivery, a senior need only give Jaycee Mohsen Khalifa a call: 508-543-2621. Nativity set on the Foxboro Common. Each December, the Foxboro Jaycees set up the Nativity Scene on Foxboro Common, on the bandstand the Jaycees built years ago . 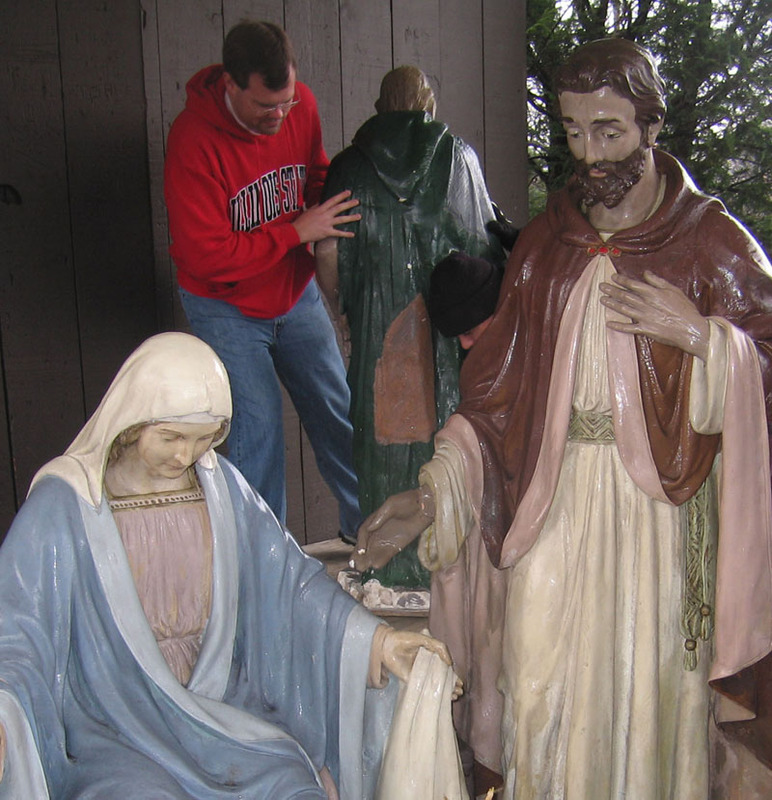 The Jaycees store the set all year, and repaint, repair, and refurbish it as necessary. We have just finished the latest refurbishing. Saturday December 5, 2009 at 9:00am. Jaycees: if you’re early, meet at Camp Lincoln Hill; otherwise please come to the common to help with set up. Santa on the Common. 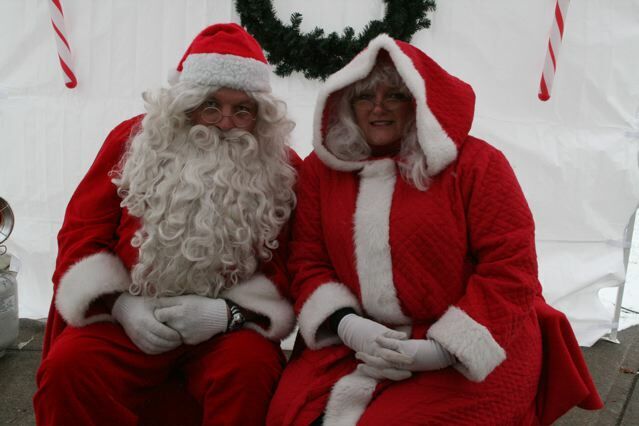 Each December, the Foxboro Jaycees welcome Santa Claus to Foxboro Common for a free afternoon of pictures with Santa, cookies, and other surprises. Each year we welcome about 300 kids. Saturday December 12 at Noon. Foxboro Common. Yankee Swap at the December 9 GM. Wednesday, December 9, 2009, 8pm. South Foxboro Community Center. Anyone 21 or over is welcome to come to our general membership meeting any time. Fruit Baskets. The Jaycees gather and create 200 baskets of fresh fruit that we deliver with the discretionary fund food boxes. Sunday December 20 at 5:00pm. South Foxboro Community Center. Adopt a kid for Christmas: Each year, the Jaycees sponsor a child through the Foxboro Discretionary Fund and help make their Christmas wishes come true. Caroling on the Common: Thursday, December 17 at 6:00pm on Foxboro Common. Have Santa call your child. Each December, the Foxboro Jaycees make special arrangements with the North Pole Telephone Company to have Santa Claus call local children. Tuesday and Wednesday December 15 and 16th from 6:00–7:30. To have Santa call your child, please send an email to santa@foxborojaycees.org. Please make the email subject “Santa Phone” and include the following information: * Which date you would like Santa to call (December 15 or 16) * Names and ages of the children being called.